AAW: Pro Wrestling Redefined is a Chicago-based promotion built around regular stars such as Eddie Kingston, Zero Gravity, Shane Hollister, Matt Cage, and Silas Young. Special guests are the norm, as well, as the likes of Zack Sabre Jr, Chris Hero, Trevor Lee, Pentagon Jr, and Abyss have all graced the AAW ring. You can find AAW DVDs via Smart Mark Video, follow the company on Twitter @AAWPro, and check them out online at AAWrestling.com. Every American independent wrestling promotion releases events on DVD or Video On Demand these days, so trying to figure out which of the non-super indies are worth your time can be quite tough. With AAW Epic 12th Anniversary, the Chicago-based org definitely makes their case that they should be on your watchlist on a regular basis. With a mix of superstar names from both the U.S. and abroad, as well as local talent that are making waves within the company, AAW lays claim to being the prominent Chicago area independent. With Epic 12th Anniversary, AAW celebrates twelve years in business. Throughout that time, several other companies have come and gone, with AAW remaining a strong constant. Now, thriving, AAW looks to the future. That’s what is so great about this 12th anniversary show, having watched it on DVD without knowledge of the results going in – The viewer gets a mix of talent they know from other places such as PWG, NXT, and ROH to keep them interested, plus a wide variety of new talent that are certainly eye catching. The most eye catching of which is likely Kongo Kong, a wrestler seemingly getting a high profile rise within AAW based off of this event. So while this is a celebration of AAW’s past, it’s most clearly a look ahead into the future. Tommaso Ciampa takes on an international star in the main event, but his original opponent for this show was Sami Callihan, the champion of AAW. With Ciampa’s big win over Zack Sabre Jr, you know a strong contender is heading into an eventual battle for the big championship. Kongo Kong wrestles twice on the show, although the second match does not feel like his second match. Each bout, the first being a tag clash and the second a singles match, is differently timed, paced, and meaningful. Another look into the future, Kongo Kong’s manager makes a clear statement that Kong wants championship gold in AAW. So if you’re just now coming into AAW, you have more to look forward to and are instantly invested in company storylines. Who wouldn’t want to see “The King of Beasts” rise to the title, going through such names as Chris Hero, Tommaso Ciampa, and Sami Callihan? Hell, as a non-regular viewer of AAW myself, I’m certainly interested. Speaking of Chris Hero, one of the best matches on the DVD is Hero vs Trevor Lee. This is a match that has happened elsewhere, but found its own uniqueness in AAW. After the 4+ star affair, Hero thanks Lee for the match while also completely shutting down a rowdy ringside fan. Yep! This is a Chicago indie after all. The visuals, and overall viewing experience on DVD, are quite nice of a “small-time” promotion. The building is obviously sold out, so you get a rowdy, fun, excited crowd from start to finish. The ring area is well lit, so everything can be see and nothing is missed in at-home viewing. The video presentation is very nice, as well – HD Video with stereo sound. You can actually get this event on Blu-Ray from Smart Mark Video, as well, adding to the video presentation. The one gripe I have about the event on DVD is such a minor gripe that I considered not even mentioning it – commentary. Dave Prazak, who you likely know from, Shimmer, ROH in the mid-2000s and IWA:Mid South before that, is joined at the booth by Phil Colvin. Prazak is wonderful for most of the event, hitting vocal inflections and excitement tones in the right spots at the right time. It is Colvin, however, I have issue with. Often, when action really gets serious, he just ducks out with “Oh!” and “No!” and fails to continue to discuss what is actually happening. Prazak at times actually picks up play-by-play, the professional that he is, because Colvin is seemingly caught up in the moment. Or, just doesn’t know what to say. Either way, it comes off poor. AAW comes off so well with this event on DVD/Blu-Ray, but Phil Colvin does not meet that level of quality on commentary. As for the wrestling, it’s above standard. I recommend two matches on the event at 4+ stars, with nothing on the show being bad. In fact, even the poorly rated matches are still fun. AAW is certainly above your local VFW Hall indie promotion, just a notch below the super-indies of PWG and ROH. Looking to add some video content of big time stars in the world of independent wrestling like Zack Sabre Jr, Chris Hero, Tommaso Ciampa, and Sami Callihan to your collection? AAW is the place. Looking to find out the substance behind the buzz for wrestlers like Kongo Kong, Kimber Lee and Candice LaRae? AAW is the place. I definitely recommend a purchase of AAW’s Epic 12th Anniversary as both a catching up point to AAW, as well as a starting point for future viewing. It truly is an event that can act as both. Both Colvin and Prazak are regularly distracted by a fan they refer to as ‘Roman Reigns.’ Prazak appears to realize they’ve gone overboard early, as he tells Colvin they probably should cease the reference. He is right. Of course, they don’t cease, and continue almost regularly throughout. AAW backstage vignettes are rare, but well done. Each one sets up an upcoming match, or future storyline, which adds a bit to the experience that you wouldn’t get live. Andrew Everett comes off as a super creeper when cutting his “Maybe I’ll come back to AAW” promo backstage. Tommaso Ciampa is sneaky big-time. Some guys look like they should be big stars, but play small. Ciampa may be the opposite. 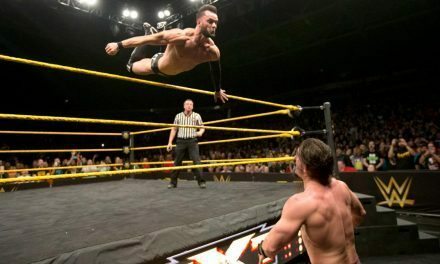 He isn’t particularly big, he’s got the beard which is all the rage these days, and he wears black and white… yet, on this show and on NXT live events, he’s a huge deal. Great for him! AAW is much like PWG in that they have outgrown their normal home (Berwyn Eagles Club), but find just as much atmosphere in their new, larger building used for the 12th Anniversary Show.